So remember last week when I told you about my love for beige and cream polka dots? Well, the obsession has made its way all the way to my feet! I couldn't find any shoes like this, so I decided to make them myself. It all started with these $9.87 faux Toms from Walmart. *Special thanks to my best friend who swooped these up for me when she saw my size. I was having a hard time finding 9.5 at my local store. 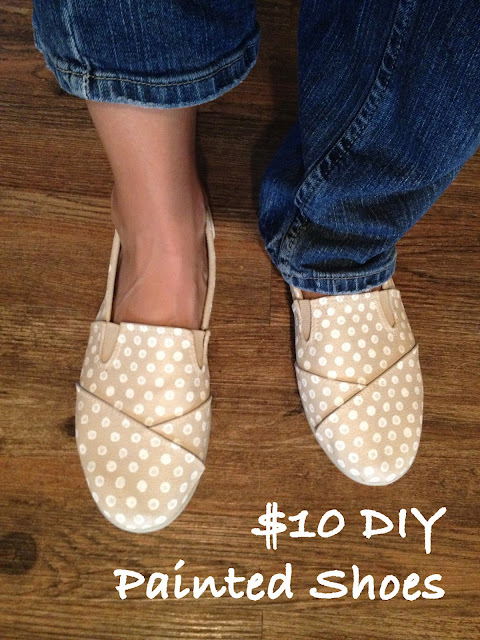 I really wanted them to be a beige color, so I painted them with Linen from Tulip soft fabric paint. It took three coats of paint since I was painting over a darker shoe. Once that was dry, it was time for the polka dots. A beige shoe is just a beige shoe– when you add polka dots it becomes the.cutest.shoe.ever. At least in my opinion, since I am a polka dot lover. If I'm going to take the time to paint my own shoe, I want it to be totally personalized. I decided the heel section was the perfect place to add a little monogram. Business Dots in the front, party monogram in the back! I just painted the monogram by hand with a small paint brush. I think an adhesive stencil would work nicely, but I didn't have one and was too impatient/cheap to go buy one! I absolutely love how they came out! They are comfortable and neutral and so "me." Plus they were only $10. What's not to love? So what do you think? Are you inspired to go to Walmart and buy some paintable shoes? They had some similar to Keds for only $6 at my local store. This would be especially fun to customize for your favorite sports team, sorority, etc. The possibilities are endless!